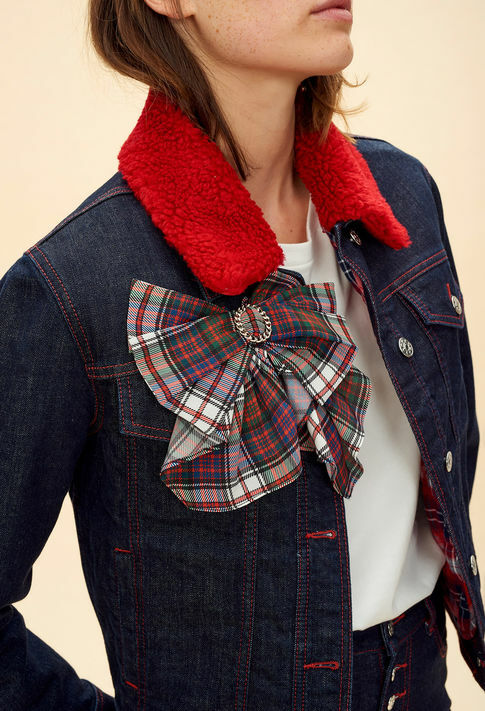 Whether it’s quirky, aesthetic, simplistic or crazy… brooches are set to take the 2019 fashion trend by storm! There are hundreds of independent sellers parading gorgeous brooches designs online at Etsy and Not On The High Street, so why not support them this Christmas for a head start above the rest in January? Even Gucci have expressed their love for elaborate jewelled pins for the upcoming spring season and we can’t wait to see what the cat walk has in store for us in the new year! So dig out your Grandma’s jewellery box, find those vintage designs and show off some bling! Here at Nora & Luna we have comprised a list of awarded winners for our brooch catwalk! We have of course, tried to keep the price down so that you can find our winners online. The Urban Forest kitty brooch is on Etsy UK for just £7.50! Who could resist that lil grumpy cat face? This rare find is handmade however there are more kitties of various colours available. From the artist: ‘I pride myself that everything in my shop is made by hand with no laser cutters. These vibrant coloured dinosaur friends are perfect to customise your winter jumper or tote bag. I fell in love with these pins from James Barker who makes them in his studio in the heart of London. At just £8.00 they exceed themselves in uniqueness! Etsy seller ThatsLovelyDear has an awesome collection of Harry Potter pins, have your christmas present sorted in the sorting hat and whizz away with one of these handmade golden snitches! Under a tenner at £7.09, this one is a must-have for you enamel pin collectors out there. This copper minimalist brooch is a stunner and will definitely give across that artistic vibe. It works well as a scarf or shawl pin (shawls are definitely making a comeback too… you heard it from us first! At £5.18 this Etsy love is an absolute bargain! By J K Foster in Canada. This striking design parades sparkles this Christmas. Got a winter wedding to go to? 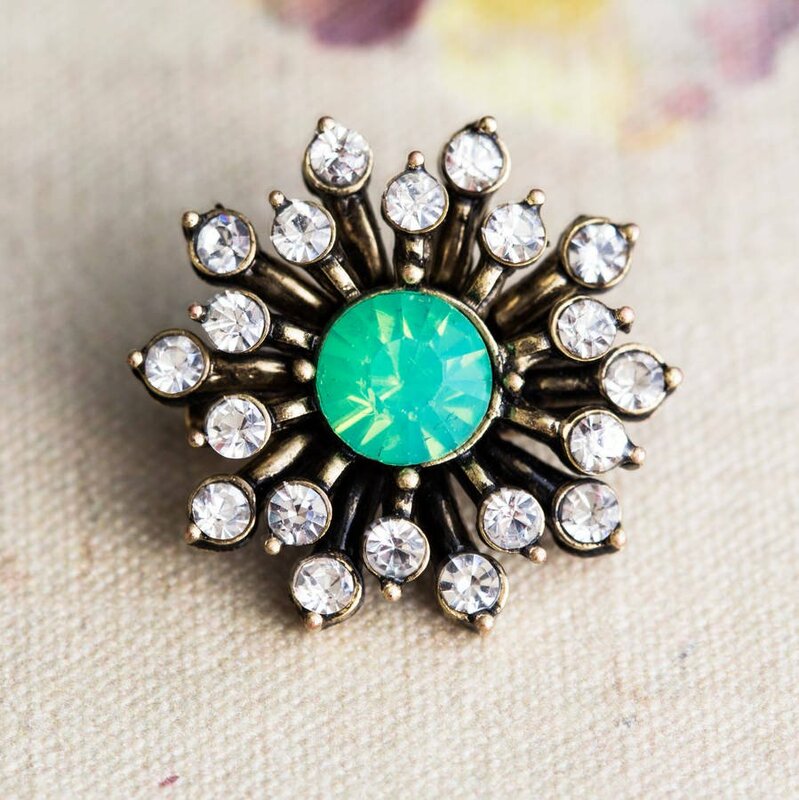 Part of Lola & Alice's fabulous vintage-inspired jewellery collection, this brooch will make a beautiful addition to your jewellery collection. This is also a perfect brooch for brides or bridesmaids. This brooch comes packaged in a pretty red gift box for just £17.00. We all know someone who loves cats just that little bit more than everyone else on the planet. This eco friendly british design will add some me-wow to your wardrobe this winter with this striking cat brooch. 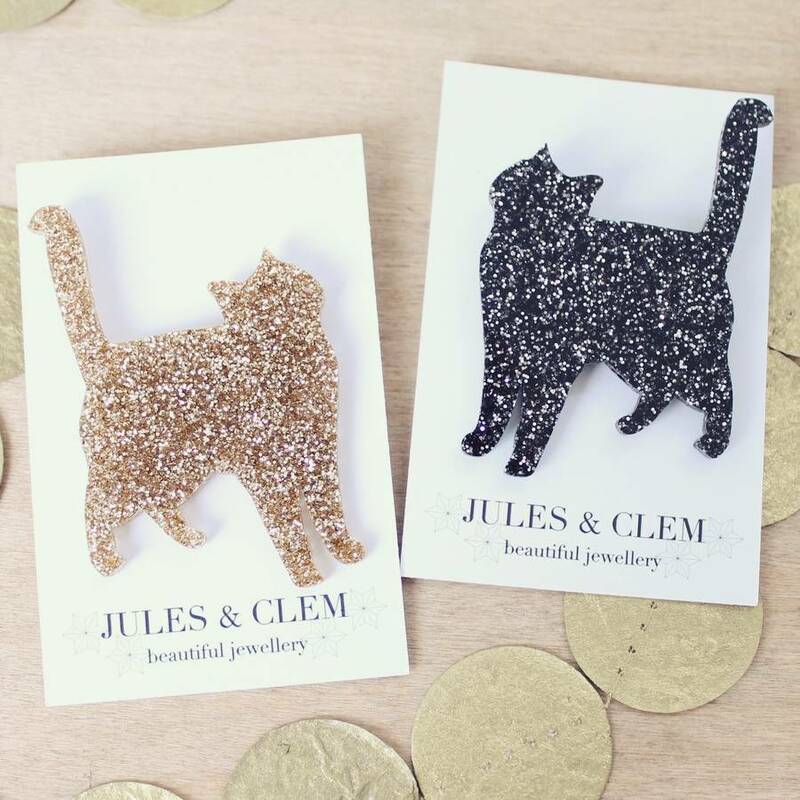 The cat brooch is laser cut from glossy black, white, grey, glitter black or glitter gold perspex. Pin him to your favourite jumper and his inquisitive head will peer up at you for guaranteed smiles all day long. The cat brooch is the purr-fect gift for cat owners and lovers alike. Order from Jules & Clem on Etsy for £12.00! Julia’s designs are handmade in Bath ands cast in London. ‘Inspired by the fox who lives on the neighbouring farm to us. He patters around at night in our back garden with his handsome face and long (always pointed) tail.’ How cute! You can buy him today from Julia’s website for just £12.00! There are just too many brooches out there to pick from, so why not send in your favourite pins? Or pin them on Pinterest! We always love to hear from you. We absolutely love this make your own video from Youtuber JENeration DIY, she teaches you how to make pins using items you already have in your house!